“TOF Error” is displayed in the status monitor. Label stock will not load automatically or printer does not detect the label stock. (LX2000). Try pressing the "Resume/Feed" button on the front of the printer. If the error continues, press the “Cancel” button and check all of the items below. 1. Sensor Type Setting. Make sure the sensor type setting in the printer driver matches the label stock installed in the printer. Open PTStatus2000 and click on the third tab down – Click on the Sensor Mode button. Die-cut/Through-hole is the default setting and the most common. Use this setting for standard die-cut stock or through-hole stock. If you are using through-hole stock you will need to adjust the sensor position. See the sensor position explanation below. Continuous Feed is used for label stock that has no black mark, die cut or through hole. The label sensor will be turned off and the LX800 will start printing at whatever point is nearest. Use this setting only for stock that will be cut after printing. Important Note: You must adjust the Sensor Type setting before loading label stock. 2. Sensor Position. The sensor position may need to be adjusted for your label stock. 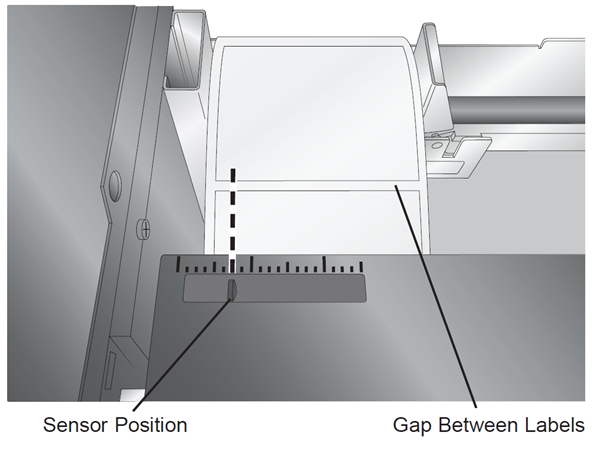 The sensor can be adjusted using the slide bar on the inside of the printer. Set the sensor position to correspond to any point where it will intersect with a gap between the label stock. If you are using label stock other than standard square/rectangular die-cut labels, such as circular die-cut labels, line up the sensor with the top of the circle or the point where the gap is smallest. Important Note: You must adjust the TOF Sensor before loading label stock. 3. Reload the Label Stock correctly. When loading the stock follow the instructions in the Manual (Section 2B). The label stock should be pushed all the way to the left as you are looking at it from the front. 4. Incompatible Label Stock. If your label stock was not purchased from Primera it may not work with the printer. To determine this, try the sample roll of material which came with the printer. If the sample roll works, there could be a problem with your label stock. 5. Clean the Sensor Area. Using canned air, blow out the infeed area. Over time dust or label debris can accumulate there and cause sensing problems. The label stock should be removed before attempting this procedure. 6. Calibrate the Loop Sensor and Paper Out Sensors. Remove label stock from the printer completely. Close the cover. Open the status monitor. Click on the "i" button. Go to the Utilities tab. Click on "Calibrate Paper Out" button. You will receive a prompt when the calibration is successful. Now click on "Calibrate Loop Sensor. You will receive a prompt when the calibration is successful. 7. Restore Factory Defaults. Open the Status Monitor. Go to the alignment tab (third tab). Click on the "Restore Factore Defaults" button.